You greet other Girl Scouts and Girl Guides. their sister Girl Guides and Girl Scouts in other countries. the organizations's first 18 girl members in Savannah, Georgia. A day of appreciation for adult volunteers in Girl Scouting. An activity that provides physical and mental challenges designed to increase self-confidence and physical coordination in a safe environment. These are conducted at our camps. Girl Scout Ambassadors are girls in grades 11-12. Yearly meeting a local Girl Scout council holds to elect its board of directors and conduct other business essential to Girl Scouting in its geographic area. An adult on the leadership team for a troop. Troops are required to have at least 2 registered adults in leadership roles. The actual division of responsibilities falls to the people involved with the troop. A symbol of achievement. It means you have learned something or provided service to others. Formerly the name of the awards for Girl Scout Juniors. Includes all earned patches for Brownies, Juniors, Cadettes, Seniors and Ambassadors, requirements found in Girl Guide. The Savannah, Georgia, birthplace and childhood home of Juliette “Daisy” Gordon Low, founder of Girl Scouts of USA. The Birthplace is now a historic house museum and Girl Scout troop program facility. Girl Scout Brownies are girls in grades 2-3.
resources used by girls in the upcoming grade level and completes a project or does an activity with them. After the troop has had a taste of what lies ahead for them in Girl Scouts, it holds a ceremony to mark the transition. A ceremony that celebrates the transition from one grade level in Girl Scouting to the next. A circle formed by members of a Girl Scout Brownie troop for discussing troop business and planning activities. A safety practice that groups two or three girls together to keep watch over each other in an activity such as hiking, swimming, etc.). The system places girls of equal ability in the same grouping. Girl Scout Cadettes are girls in grades 6-8. A troop camping trip organized at a service unit level with activities planned for the group. A circle formed by members of troops at any age level for discussing troop business, planning and sharing of information. Fund raising program for troops and the council which teaches skills such as budgeting, goal setting and marketing. Geographic area that includes clusters, service units and troops. Chartered by GSUSA. A ceremony where girls receive awards for their achievements. Girl Scouts Daisies are girls in grades K-1. A nickname for Juliette Gordon Low, founder of Girl Scouts. Camping by the day or camping within a 12-hour program day – usually for 3 to 5 days. Training for camp administrative staff is provided by council and camps require council approval to operate. This administrative staff procures the camp site and recruits their volunteer camp staff. The volunteer camp staff, with help from older girls, plan and carry out programming and daily activities. Girls from different troops can sign up as individuals and go through the camping experience in temporary groups/units. Girl Scout activities that fall into one of fire different categories – international, outdoor, science, people or getaways. All destinations events provide an opportunity for individual members to broaden their perspectives and give Girl Scouting an enhanced visibility. Amount troop decides will be paid by girls to their troop to support its activities. A mesh cloth bag with a drawstring, used to sterilize and hang mess kits (dishes and eating utensils) for drying. 1.Name and contact information listed on the registration form. This is a person other than the parent or guardian who may be contacted in case of emergencies when parents cannot be reached. 2.When troops are on field trips, there should be a designated parent or adult with contact numbers for all people on a trip and for all families. This person serves as the go-between in the even of an emergency while the troop is away. A trip lasting more than three nights. May require a health examination as well as a health history, local Girl Scout council approval, and additional insurance coverage. A fund raising program for girls through which they sell nuts, candy, and magazines. Troops retain a percentage and learn skills such as marketing, money management and goal setting. A program usually conducted by a service unit during which older girls and adults prepare fairy themed activities and decorations for young girls (usually Daisy or Brownie). It may be done as an overnight or as a day of activities. A first-aider is an adult who has been certified in first aid and CPR through an approved organization. A first-aider is needed for physically demanding activities and other activities involving a potential for injury. Please see Safety-Wise or Volunteer Essentials for more information. The event at which a Girl Scout Brownie receives her Brownie wings and becomes a Girl Scout Junior. 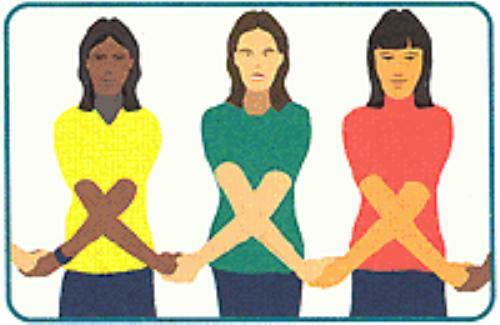 A circle formed by Girl Scouts standing and clasping hands with right arms crossed over the left. The circle represents the unbroken chain of friendship among Girl Scouts and Girl Guides all over the world. Typically done as part of a closing of a meeting or ceremony. A hand squeeze that travels around a friendship circle from one person to another after someone starts it. Some troops opt to put a foot out into the circle to show that the squeeze has passed them. A patch a girl may wear on the back of her sash or vest. The patches are intended to recognize special events and occasions as a remembrance. Some patches have requirements, but most do not. The term used to identify girls and adults who are members of the Girl Guiding movement in many countries. Agnes Baden-Powell, sister of the Boy Scouts' founder, Lord Baden-Powell, started the first Girl Guide troops in England. Girl Guides and Girl Scouts are part of the World Association of Girl Guides and Girl Scouts (WAGGGS), headquartered in London, England. March 12th is the anniversary of the found of Girl Scouts. Girl Scouts was founded in 1912. Along with the Girl Scout Promise, the Girl Scout Law is the credo of Girl Scouting. A girl lives the 10 parts of the Girl Scout Law to fulfill the Girl Scout Promise. A day of appreciation for adult volunteers in Girl Scouting held on April 22nd every year. A girl-planned ceremony around a theme of the girls' choosing. Along with the Girl Scout Law, is the credo of Girl Scouting; the pledge that binds members together as part of the Girl Scout movement. A girl must make the Promise to become a Girl Scout member. Made by raising three fingers of the right hand, with pinkie finger and thumb folded in. 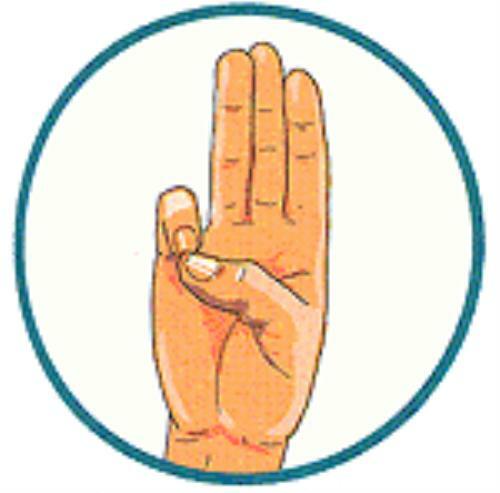 This sign stands for the three parts of the Girl Scout Promise. 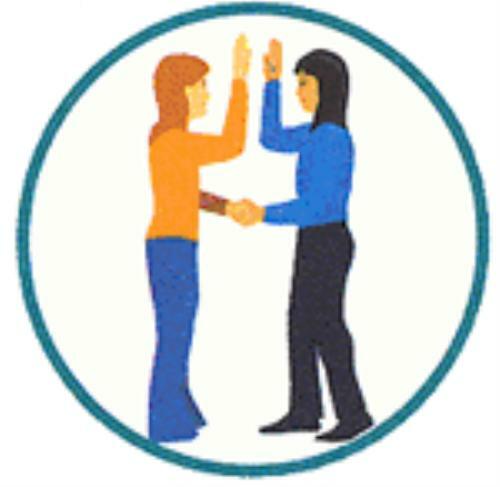 You give the sign when you: say the Promise, are welcomed into Girl Scouting at an investiture ceremony, receive a patch, pin, or badge, do the Girl Scout handshake, and greet other Girl Scouts and Girl Guides. The week in March which the Girl Scout Birthday occurs. The highest award a Girl Scout Senior or Ambassador may earn. Girl Scouts of the United States of America, our national organization. The umbrella term for earned grade level awards, religious and other awards, emblems, and participation patches and pins on the front of a Girl Scout uniform. Formerly, awards earned by Cadette, Senior, and Ambassador Girl Scouts. With the introduction of Girls Guide to Girl Scouts, these age levels will be earning badges for their age level. A ceremony in which an individual becomes a member of Girl Scouts by making the Girl Scout Promise and receiving a membership pin. A key part of the Girl Scout leadership experience is the leadership journey, a coordinated series of activities grouped around a theme. Each journey is tied to some of Girl Scouts' 15 national outcomes for girls, as defined in the Girl Scout Leadership Model. These outcomes are integral to the three leadership keys: Discover, Connect, and Take Action. Founder of the Girl Scout movement in the United States. Also known as Daisy. A Girl Scouts of the USA operated fund that supports educational programs, service projects, training and international travel to foster friendship among girls from the 144 countries of the WAGGGS. Girls Scouts Juniors are in grades 4-5. A job or task to be done. A visual way of organizing the work to show who does what and to keep distribution of the kapers fair. An adult in a leadership role for the troop. Designating '01' as the position code on the registration form makes this person the primary contact for the troop. Unbreakable plastic or metal dishes, cup, and eating utensils for use at camp or outdoor settings. Stored in a dunk bag for sterilizing and hanging. An activity planned and carried out by girls to earn money for troop expenses. The activity should include a learning component. This is in addition to council sponsored programs (fall products and cookie programs). An online class which serves as the first introduction to Girl Scouting for new volunteers. Small group of girls that plans and carries out activities within a troop. Elected or appointed leader of a troop patrol. Girl Scouts offers many ways for a girl to participate in Girl Scout programming. Examples include troops, camp, events,special interests, travel and virtual. Petals are the awards earned by Daisy Girl Scouts. Each petal represents one line of the Girl Scout Law, and are placed in a circle around the Promise Center. Girls may place the petals around the center in any order they choose. Leaves are earned in Financial Literacy and Cookie Business and are placed beneath the Petals. A Cadette who works directly with a troop under supervision of an adult volunteer. The Program Aide is required to attend training sessions where she gains expertise in a particular field of interest, such as songs, ceremonies, games, fairy myst, etc. The blue center to the Daisy Petals, worn on the front of a Daisy tunic, sash or vest. 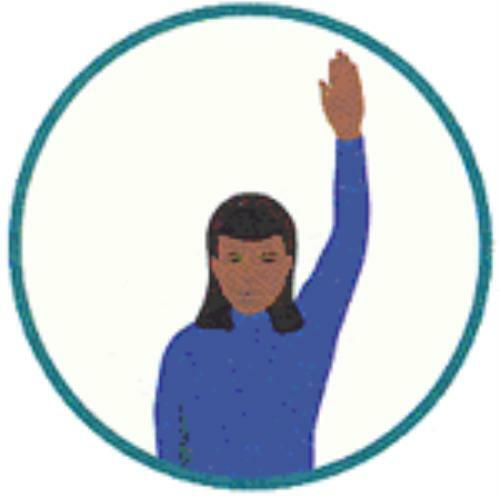 Raising the right hand over the head to signal for attention and quiet at any Girl Scout gathering. When the hand goes up, mouths go quiet, and everyone joins in giving the quiet sign. A reaffirmation of the Girl Scout member's belief in the Girl Scout Promise and Law. Form parents sign giving written permission for a girl to become a member of GSUSA and that adult members also sign when they join. All membership dues go to GSUSA. Official awards earned for completing requirements set by religious organizations or by GSUSA. These awards are all worn on a similar place on the Girl Scout uniform. When preparing for any activity with girls, always begin with the Safety Activity Checkpoints written specifically for that particular activity. These checkpoints discuss steps to take in advance of the activity and may be downloaded at www.gsmidtn.org in the resources section. A geographically organized group of troops, individual members, etc. that are led by a volunteer team. The volunteer leader of the service unit team. Volunteers of the service unit. The team usually consists of a service unit manager, recruiter, registrar, fall products and cookie coordinators, as well as trainers. The highest award for Girl Scout Cadettes. A lightweight pad of mat used when sitting on the floor or ground. An individual, business, organization or institution which provides non-financial support to a Girl Scout troop. Three-leaf shape, traditional symbol used worldwide by all members of the World Association of Girl Guides and Girl Scouts. Awards for Brownie Girl Scouts. With the introduction of Girls Guide to Girl Scouting, Brownie awards will be called badges. A valuable resource available through www.gsmidtn.org which explains the history and philosophy of Girl Scouts, provides guidelines for troop management, troop travel, financial management, girl awards, ceremonies, and much more. An association of Girl Scout and Girl Guide national organizations around the world. WAGGGS serves approximately eight million Girl Scouts and Girl Guides in 144 countries. 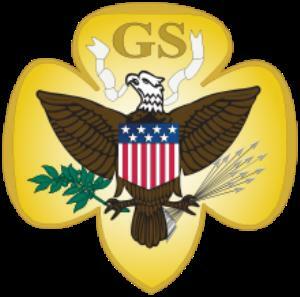 Through GSUSA's membership in WAGGGS, each girl and adult registered as a Girl Scout in the United States becomes part of the Girl Guide/Girl Scout world movement. The World Association's mission is to enable girls and young women to develop to their fullest potential as responsible citizens of the world. February 22, the birthday of both Lady Baden-Powell, World Chief Guide, and her husband, Lord Baden-Powell, founder of the Boy Scouts. First celebrated in 1927, Girl Scouts and Guides all over the world use the day to think of each other and exchange greetings, learn about other countries, and give to the Juliette Low World Friendship Fund. The membership pin of WAGGGS usually presented to members around the World Thinking Day and is worn by members throughout the world. This pin is always worn above the Girl Scout membership pin.